My husband and I celebrated our 18th wedding anniversary this month. I thought I might share the unusual way in which we met, and then decided to do so using eight things that remind me of the journey that brought us together. Howdy – Doug and I first met online in October of 1997. At the time, my family and I lived in Oregon while Doug and his family lived in Texas. Our moms were e-mail pen pals when they discovered their oldest kids were both in college. Having enjoyed both snail mail and e-mail pen pals most of my life, I was open to e-mailing Doug, but said I would prefer it if he sent the first letter. There was a part of me that didn’t really expect him to. Much to my surprise, within a day or two, I received my first e-mail from Doug, and it started out, “Howdy, Ma’am.” I wrote him back that same day, and we continued to exchange e-mails on a very regular basis. AOL Instant Messenger – About a year into e-mailing, we started to chat on AOL IM. That was always fun, and sometimes we’d talk way longer than we should, especially considering the papers and other homework we had from our classes at our respective universities. But as time went on, we shared everything about our days. I considered Doug to be my best friend, and looked forward to each e-mail and IM session. Camping in Williams- In July of 1999, over a year and a half after we exchanged our first e-mails, our families decided to meet. 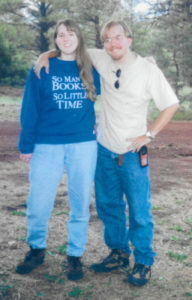 Since we lived in Oregon and Doug lived in Texas, we chose to meet in Williams, Arizona for a camping trip. I’ll never forget the butterflies in my stomach as my family and I drove there, wondering what it was going to be like to actually see and speak to Doug in person. We’d exchanged a few photos, so at least we knew what everyone looked like. But still, this was very different from e-mails or instant messages. I remember our family got to the campground first, and when we saw Doug’s family pulling in, we went to greet them. I had no idea what to expect, but it was as if that year and a half of talking online might as well have been in person. We picked up right where we left off. It was love at first sight for the both of us. Toy Story 2 – After the camping trip, we began to call each other and talk on the phone several times a week. We went through a LOT of phone cards back then, because that’s what we purchased for our numerous long-distance conversations. After getting to visit in Arizona, it was hard to go back to just e-mail and IMing. That December, Doug made the decision to fly down for a couple of days to visit. That’s when we went on our first official date: We took public transportation to the mall downtown and watched Toy Story 2 in the theater together. Every time our kids watch those movies now, I remember watching it for the first time with Doug there, and it always makes me smile. 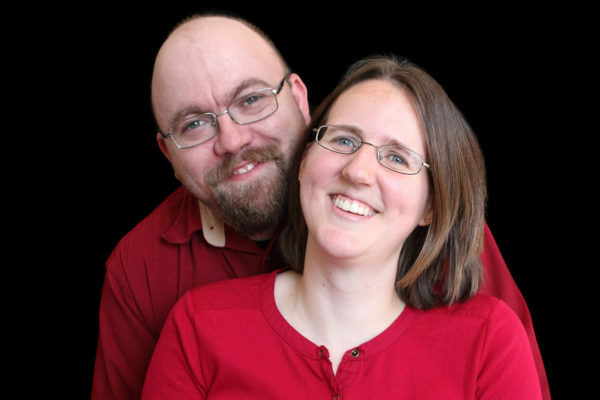 Godsend – Choosing to get married was one of the easiest decisions I’ve ever made. I have no doubt that Doug was the person God made for me. “Godsend” by DC Talk is the song that we played at our wedding, and I think it describes how we feel about each other perfectly. If you haven’t heard the song before, you should definitely give it a listen. A Simple Wedding – We got married in June of 2000, less than a year after meeting in person for the first time. It was a lovely, simple wedding in my parents’ backyard. We didn’t go anywhere for a honeymoon because Doug had to be at work on Monday, but everything was perfect. After having a long-distance friendship and relationship, just being married and knowing we wouldn’t have to do that again was huge. Together – Life together has been quite the adventure since then. In the last eighteen years, we’ve moved four times, dealt with infertility for many years, finally welcomed two beautiful children into our lives, and have been navigating the unpredictable waters of parenting a child with autism. We’ve been there to support each other through it all. Eighteen years later, I can honestly say that my husband is still my best friend. I can’t wait to see what God has in store for us in the future! How sweet. Thank you for sharing. Hi Melanie! Happy Anniversary and thanks for sharing your unusual courtship. The Hubby and I celebrated our 45th anniversary this month. Since he was finishing his college degree and I was teaching school 350 miles away, we used snail mail and in those days AT & T had a “nickel a minute” long distance plan between the hours of 7 pm and 7 am. Thanks for reminding us of the blessings of modern technology. On Thursday, our 17 month granddaughter Seeley was missing her 4 year old cousin Maddie, who was on vacation with her family. Seeley just learned how to say Maddie’s name and so I sent a video clip, not knowing what my son’s plans were for the day. A few minutes later, my son called and so the two cousins video chatted via FaceTime. Definitely a different time from 1970s or 2000, when preschoolers are thrilled to connect and see each other. Made this Oma’s (grandma) day. Best wishes. Enjoy your weekend. How neat that your granddaughters were able to visit and see each other on FaceTime! What a wonderful gift! My mom and brother recently moved to our town. But ever since our son was born 12 1/2 years ago, we have Skyped with my brother, mom (and dad before he passed in 2011) every week. It was a wonderful way to stay in touch and for the kids to see them and visit with them. Such a wonderful gift! Thank you, I hope you have a lovely weekend as well! Congratulations on 18 years of Wedded Bliss! My husband and I just celebrated 42 years. Talk about time flying by! Thanks for sharing your life story. Thank you, Janet! Congratulations to you and your husband on your 42nd anniversary. You’re right, time sure does fly by! I enjoyed reading your sweet story. Happy Anniversary! Happy Anniversary!!!! Enjoyed your story. Here’s to not just 18, but 36 more!!!!! Thanks for sharing your story. I’m glad you and family are blessed. I love your sweet story, Melanie. Happy Anniversary! What a neat story! My husband and I met in Korea (we were both in the military) and have just celebrated 30 years. That’s awesome, Kris! Happy anniversary to you both! Thank you! It’s been a wonderful 18 years, and I look forward to many more! I love hearing stories about how couples met. Happy anniversary, this was a beautiful story! Melanie, I really enjoyed reading how you and your hubby met. Congratulations on your 18th wedding anniversary. I enjoyed seeing the pictures you shared with us. My hubby and I celebrated our 45th wedding anniversary on the 9th of this month. We started out as pen pals and it progressed like your love story did. We quickly went to phone calls which were more expensive back in the early 70’s. There were flights between Washington DC where I lived and Atlanta where he lived. Our first official date was also a movie. After all of these years I can’t recall what the movie was. After 45 years were are still happily married. I forgot to mention that God blessed us with a grandson who was diagnosed with high functioning Aspergers Syndrome when in first grade. He is 17 now and will be entering his senior year of high school. He has done great in school. I want to wish you and your hubby many blessings on the years ahead. Thank you for sharing how you and your husband met. What a great story!! I love how many similarities there are between us. Happy 45th anniversary! That’s great your grandson is doing so well! Our son has autism also. I wish you and your husband and family nothing but the best!! I love your romance story, Melanie. Genuinely liking someone makes for the best romances and then marriages in my opinion. 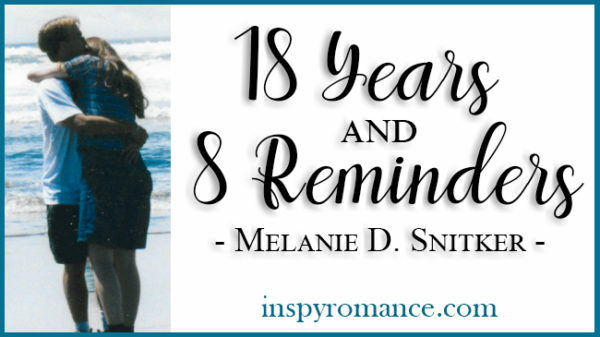 Melanie, happy anniversary, and thanks for sharing your journey of love. So sweet! Wow!! I am amazed that we actually share the same anniversary. 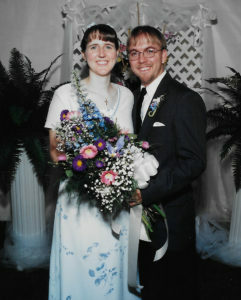 My husband and I were married in june of 2000. I loved reading your post. Happy anniversary. Happy Anniversary. My husband and I just celebrated our 36th anniversary last month 😊💕. I loved reading this! My husband and I will be celebrating our 25th anniversary in January and your post made me start thinking of what words/phrases I would use and, immediately, the first there that came to mind were bowling, God and snow.